The first step on our journey toward building our graph API is constructing its schema. You can think of a schema as a blueprint for all of the data you can access in your graph. Throughout this section, you'll learn how to build and explore your graph's schema with Apollo. Before we write our schema, we need to set up our graph API's server. Apollo Server is a library that helps you build a production-ready graph API over your data. It can connect to any data source, including REST APIs and databases, and it seamlessly integrates with Apollo developer tooling. The two packages you need to get started with Apollo Server are apollo-server and graphql, which we've already installed for you. Now, let's navigate to src/index.js so we can create our server. Copy the code below into the file. To build our graph API, we need to import the ApolloServer class from apollo-server. We also need to import our schema from src/schema.js. Next, let's create a new instance of ApolloServer and pass our schema to the typeDefs property on the configuration object. Before we can start the server, we need to write our schema first. Every graph API is centered around its schema. You can think of a schema as a blueprint that describes all of your data's types and their relationships. A schema also defines what data we can fetch through queries and what data we can update through mutations. It is strongly typed, which unlocks powerful developer tooling. Schemas are at their best when they are designed around the needs of the clients that are consuming them. Since a schema sits in between your clients and your underlying services, it serves as a perfect middle ground for frontend and backend teams to collaborate. We recommend that teams practice Schema First Development and agree upon the schema first before any API development begins. Our schema will be based on these features. In src/schema.js, import gql from Apollo Server and create a variable called typeDefs for your schema. Your schema will go inside the gql function (between the backticks in this portion: gql``). We'll start with the Query type, which is the entry point into our schema that describes what data we can fetch. First, we define a launches query to fetch all upcoming rocket launches. This query returns an array of launches, which will never be null. Since all types in GraphQL are nullable by default, we need to add the ! to indicate that our query will always return data. Next, we define a query to fetch a launch by its ID. This query takes an argument of id and returns a single launch. Finally, we will add a me query to fetch the current user's data. Above the me query is an example of a comment added to the schema. How do we define what properties are exposed by Launch and User? For these types, we need to define a GraphQL object type. The Launch type has fields that correspond to object and scalar types. A scalar type is a primitive type like ID, String, Boolean, or Int. You can think of scalars as the leaves of your graph that all fields resolve to. GraphQL has many scalars built in, and you can also define custom scalars like Date. You'll notice that the field missionPatch takes an argument of size. GraphQL is flexible because any fields can contain arguments, not just queries. The size argument corresponds to an enum type, which we're defining at the bottom with PatchSize. There are some other less common types you might also encounter when building your graph's schema. For a full list, you can reference this handy cheat sheet. Now, let's define the Mutation type. The Mutation type is the entry point into our graph for modifying data. Just like the Query type, the Mutation type is a special object type. Our mutation response type contains a success status, a corresponding message, and the launch that we updated. It's always good practice to return the data that you're updating in order for the Apollo Client cache to update automatically. Now that we have scoped out our app's schema, let's run the server by calling server.listen(). In your terminal, run npm start to start your server! 🎉 Apollo Server will now be available on port 4000. By default, Apollo Server supports GraphQL Playground. 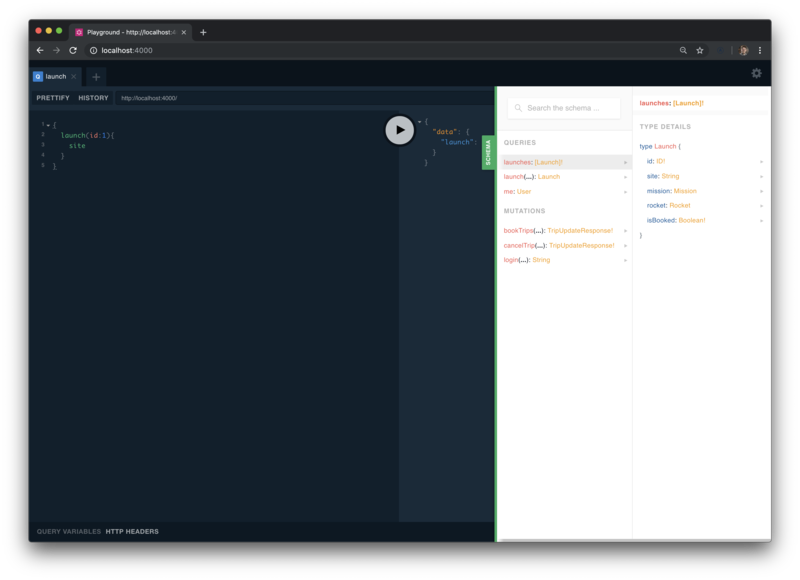 The Playground is an interactive, in-browser GraphQL IDE for exploring your schema and testing your queries. Apollo Server automatically serves GraphQL Playground in development only. The GraphQL Playground provides the ability to introspect your schema. Introspection is a technique used to provide detailed information about a graph's schema. 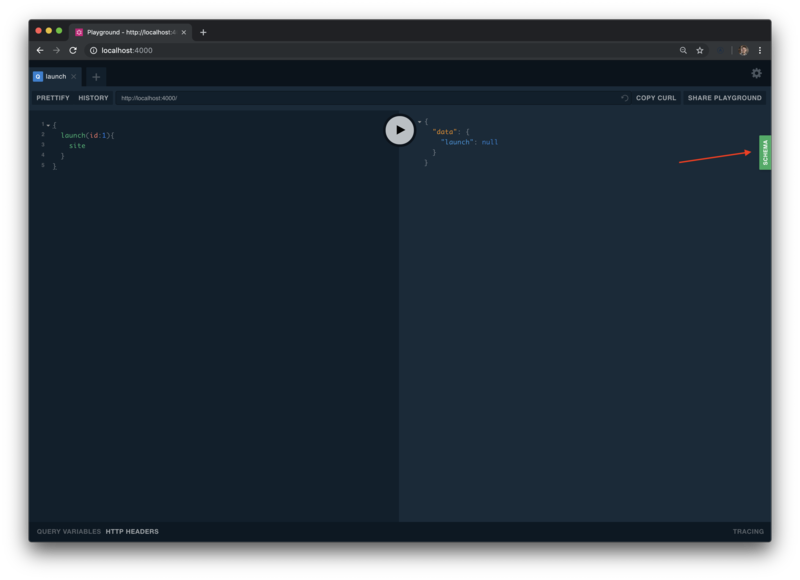 To see this in action, check out the right hand side of GraphQL Playground and click on the schema button. You can quickly have access to the documentation of a GraphQL API via the schema button. That's all for building our schema. Let's move on to the next part of our tutorial.